Kircheis just wishes this was in a stein so as to fit the season. The 8th episode of this arc is a strictly social one with a look at both aristocratic and common life on Odin. Kircheis returns home for the first time in eight years to reunite with his parents and those he knew when he was younger. He also visits the former Müsel residence; now owned by another family with tragic circumstances. Meanwhile, Friedrich thought he made a decision to make Reinhard’s life easier by allowing him to inherit a noble title. This, however, would not go down well with the rest of the aristocracy. Also, a strange rumor about Luneberg’s heritage begins to gather steam. 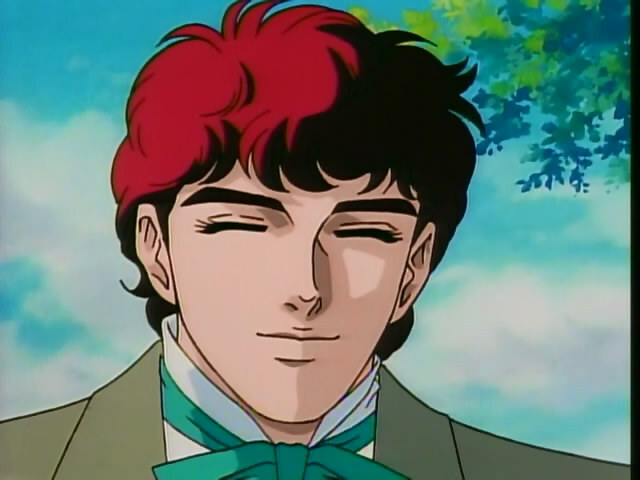 The early part of the episode focuses on Kircheis and his return home. As it is near Whitsunday, Odin had a festive feel. Kircheis ducked into a pub and ordered a beer and some lunch before placing a call. He hoped that no one would be home so he could just walk by the house and get everything over with. However, his mother picked up which started a series of events where he caught up with his past. The bartender recognized him from before; when he returned home he noticed how different his parents seems since he had been raised by the military for 8 years. That final realization that you are no longer a child. The dinner conversation between Kircheis and his parents was rather ordinary. Kircheis wanted to know if his father still grew orchids only to find out he built a greenhouse for that purpose from the money that Kircheis sent them. His mother was upset that they would waste that money, when Kircheis would need it in the future for his own children. Then Kircheis evaded questions about relationships by pointing out how they had married at an older age. The next day, Kircheis visited Reinhard’s old house to find it inhabited by an older couple who struggled with its upkeep. As Kircheis entered he saw everything was faded and broken down. As he entered the final room, he realized why they struggled with the upkeep. Their three sons had died in battle within a few years of each other. This affirmed Kircheis’s thought that he was living off of the deaths of others at times. Only Kircheis could smile that much as he was correcting someone who was wrong about Reinhard. He then chatted with a childhood friend named Martin after they ran into each other in town. He was studying classic at the national university, but since it wasn’t an important enough category of study, he would be drafted into the military when he turned 20. They lamented how twisted the Empire in implementing a system like that. 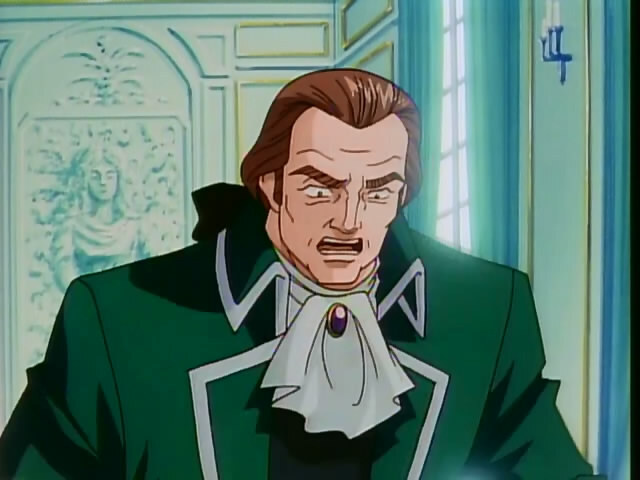 After Martin disparaged Reinhard as a typical officer who would send him to die on the battlefields, Kircheis had to correct him. They parted ways for what would end up being the final time as Kircheis later discovered he had died of malnutrition in a facility holding political prisoners. A few days later, Friedrich met with Grimmelshausen where Reinhard was the topic of discussion. Grimmelshausen praised Annerose via Reinhard’s looks. Friedrich then floated an idea that he had been considering for a while. While it would not be a problem for Reinhard now, he thought that he should bestow a legitimate aristocratic family name on him. Grimmelshausen thought that would be a splendid idea. The attempted cake bribe just makes Reinhard even more of a tsundere character. Reinhard received the news quickly and was given a list of families to be considered. This caused considerable scorn among the rest of the aristocracy. Littenheim and Braunschweig separately condemned the decision made by the Kaiser as betrayal of the aristocracy. While this would have meant an arrest for a commoner, aristocrats were able to publicly criticize the Kaiser in the open. Meanwhile, a rumor about Luneberg was beginning to spread. That Luneberg was actually his mother’s name, and that he was really from the Goldenbaum family. His defection back to the Empire was meant to allow him to succeed the royal family. Kircheis reported this to Reinhard, who worried first about Luneberg’s safety. Then, he thought if Luneberg was spreading it himself that he was a horrible schemer. Regardless, Reinhard was willing to take the title of Count if it made his own ascent easier. Thoughts: I liked the instant switch in thought from concern about Luneberg’s safety to wanting to do him in. Luneberg’s biggest threat now seems to be Reinhard himself, which is fine by me. 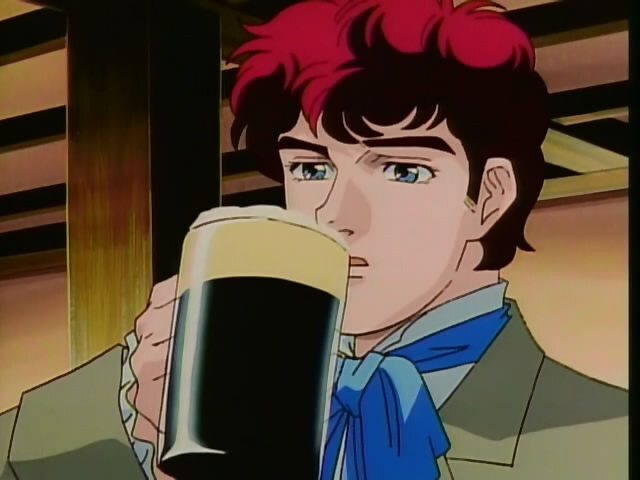 It’s good to see that Kircheis likes his stout beer. Always very pleasing when one is returning home. Kircheis always evaded the relationship questions didn’t he? Did any one ever know of his true affections? I know Reinhard was incredibly dense about relationships, but I think he would have put it together at some point. At least I hope Oberstein would have put the facts together as well. Oh yeah. Oberstein was so sharp that he probably would have guessed after a couple of glances. On the other hand he wasn’t big on relationships either. Didn’t he put it together at some point? During the call to his sister after Kircheis’ death? 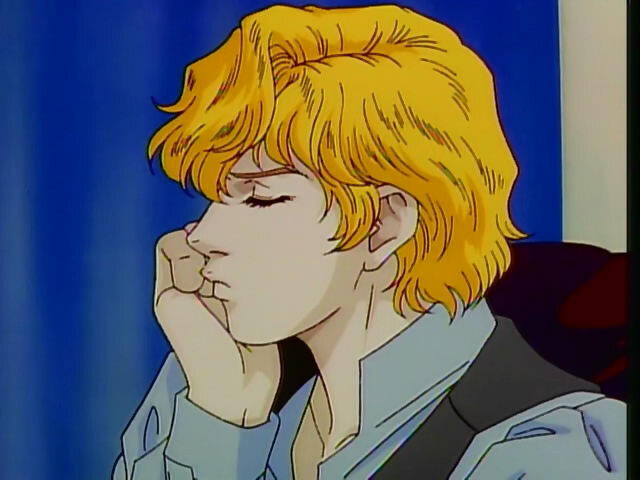 I believe Reinhard probably figured out Annerose’s feelings, but Kircheis I’m not so sure about. Reinhard definitely did. He asked her flat out.